The main diagnostic features of this style are the so-called “gripping beast” motif and the use of sinuous animals. Both these features can be seen on the gilt-bronze bridle-mounts found in a man’s grave at Broa on Gotland shown here on the right. Some of the earliest examples of this style are to be found on objects from the Oseberg ship burial. 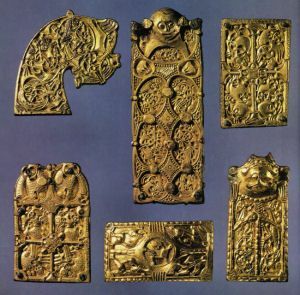 The “gripping beast” motif is what clearly distinguishes the early Viking art from the zoomorphic styles that preceded it. The chief features of the “gripping beast” are the paws that grip the borders around it, neighbouring beasts or parts of its own body. It was obviously a style that appealed to the Vikings, for it remained an important motif in Viking art for over a hundred and fifty years.